The Leviathan 4-4-0 No. 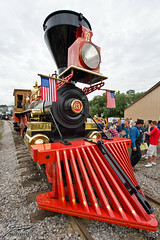 63 made it's first public appearance at the Train Festival 2009 in Owosso, Michigan. This is the newest steam locomotive having been just completed earlier this month. Though it was inspired by the locomotives of the Golden Spike Ceremony, this new 0-4-0 is powered by oil rather than wood or coal. This was the first opportunity I had to see the impressive locomotive. Sadly with the mass of people I couldn't get the photos I'd have liked to grab.